Dramatic lighting, movement, art that activate the viewer's space. Lord, where are you going? As Peter recoils in astonishment, a muscular Jesus points the way to Rome. 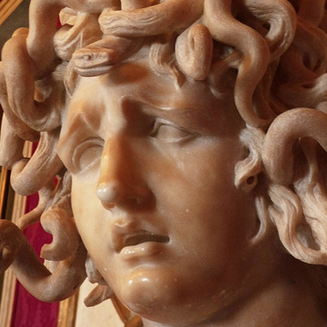 She’s a monster, but in this poignant marble bust, Medusa becomes a victim of her own plight. Uniting spiritual and earthly realms, Caravaggio has left a space open for us in this circle of mourners. Embracing his own reflection, Narcissus falls in love with himself—and into the water. Good thing it’s just paint! A world turned upside down? Caravaggio not only upends St. Peter, but also turns artistic convention on its head. As the apostle’s tattered green shirt suggests, this is a rough and tumble world, far from the pomp of the Church. The Baroque doesn’t have to be loud, as this intimate and quiet sculpture demonstrates so well. No wonder this interior space feels sculptural—the architect was a stone cutter by trade. Central to the Counter Reformation, Bernini’s double colonnades activate St. Peter’s and reach out into the city.